When I am asked to develop a website I find that it is helpful to frame the initial discussion so that everyone is on the same page and understands the overall process and what’s involved. This can be a real eye opener for some as they begin to realize what it takes to put it all together. 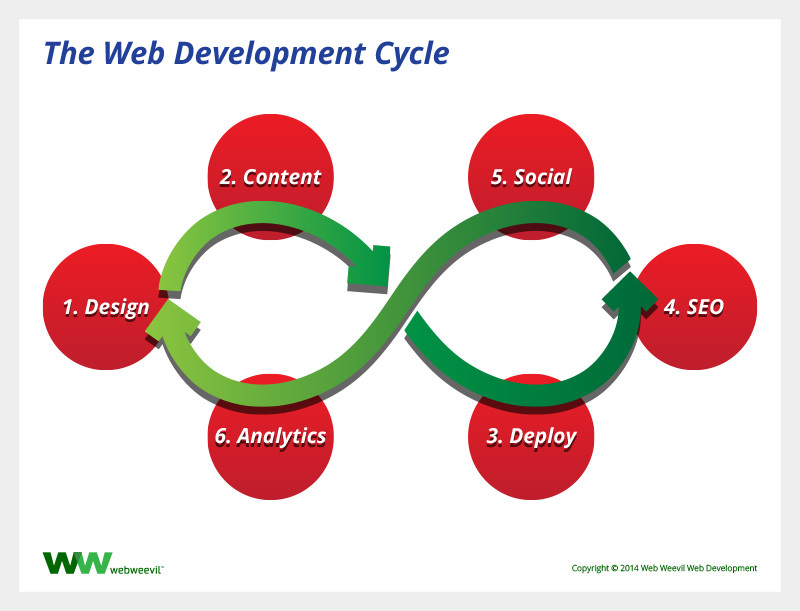 While not necessarily this linear, there are cross-over and back and forth interactions as needed, the process I explain breaks down like this: Design, Content Development, Deployment, Search Engine Optimization (SEO), Social Media, Analytics and Metrics. 1. Design – developing an overall template for the look of the website while taking into consideration the current business identity, including its current advertising and marketing campaigns. Also take into consideration trends and best practices with current web standards and mobile devices. 2. Content – this consistently seems to be the last thing thought about and, in my experience, what delays the process the most. Identify and mapping out the top level menu items is a quick way to get focused on what needs to be created. Considering how important relevant and authoritative content is to Search Engine Optimization (SEO) plenty of care and thought should be given and time invested. 3. Deployment – this is usually where I need to take some time to explain how website hosting works as well as discussing domain name registration and domain emails. Since WordPress is my content management system (CMS) of choice the process of deployment usually starts with a clean, self-hosted WordPress installation. By this time the approved design has been converted into a WordPress theme which is installed along with any necessary plugins. The last steps are to create all the necessary page structure (and post structure for a blog) and get the content for each page input and the website menus setup. 4. Search Engine Optimization (SEO) – while this could be another part of the deployment process in step three I prefer to give it a separate focus because of the importance of SEO. Although during the content development phase solid content should have already been created there are still other tasks to be completed. For example, each page needs to have unique meta data created for the page title and description, images need to have descriptive ALT tags added, applicable outbound and internal links need to be set, and more! There are WordPress plugins that help to make sure that each page is optimized based on the content to maximize search results. I use the WordPress SEO Plugin by Yoast. Also submitting consistent and complete website information to search engines and other online directory listings to maximize relevant search results and get reviewed. 5. Social Media – social media (Facebook, Twitter, Google+, LinkedIn, etc.) should be part of a comprehensive digital marketing strategy for the website. At the very minimum website pages should include a method for visitors to “share” what they are reading to their own social media accounts. Even better, linking from the website to your own social media pages and profiles that have the same consistent design and descriptive information that is found on the site’s home page. 6. Analytics and Metrics – the final step is making sure that visitor activity to the website and social media pages is being consistently gathered, monitored and evaluated. Using free services like Google Analytics, Google Webmaster Tools and Jetpack by WordPress for example can give you crucial data about your visitors. This information can be used to further optimize and develop your website’s layout and content. All this helps to better meet your visitors expectations so they find what they are looking for and maximizes the possibility that they will return more often. As illustrated below this is a cyclical process that should continue throughout the lifetime of a website. The last step leads us right back to step number one where it starts all over again to one degree or another. Developing a website is just the start. Actively monitoring, analyzing, shaping and re-shaping the website, keeping it relevant, new and engaged with an audience should be the ultimate goal. In my experience, one to three months on average, although six to nine months at times is not out of the realm of possibility. If you’d like a free, no obligation review of your website or to discuss your current web strategy and goals please contact me.